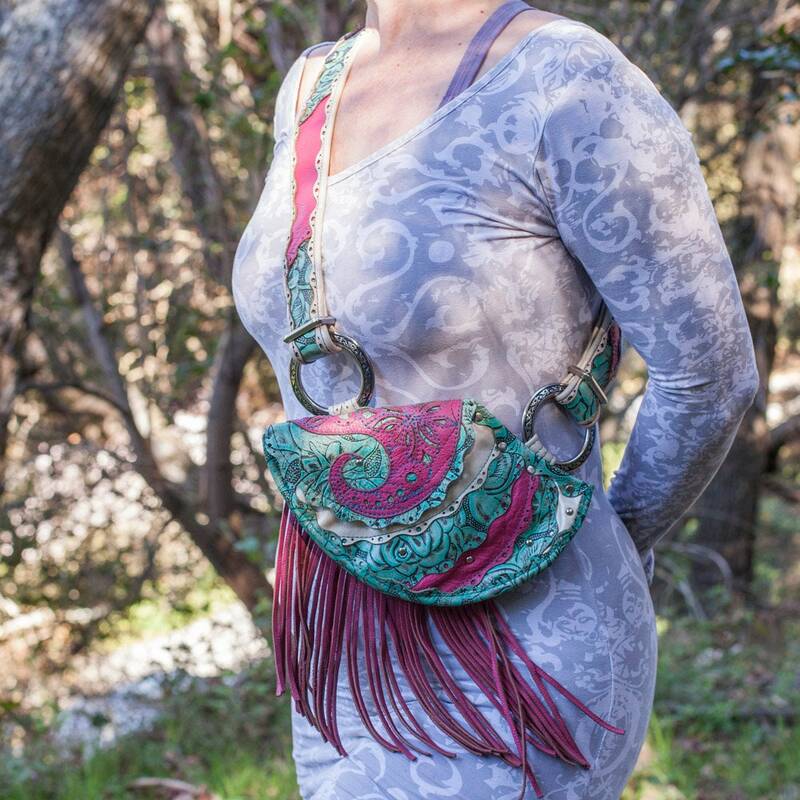 The Women's Chrysalis Sling Purse design takes direct inspiration from our popular Women's Chrysalis Holster. 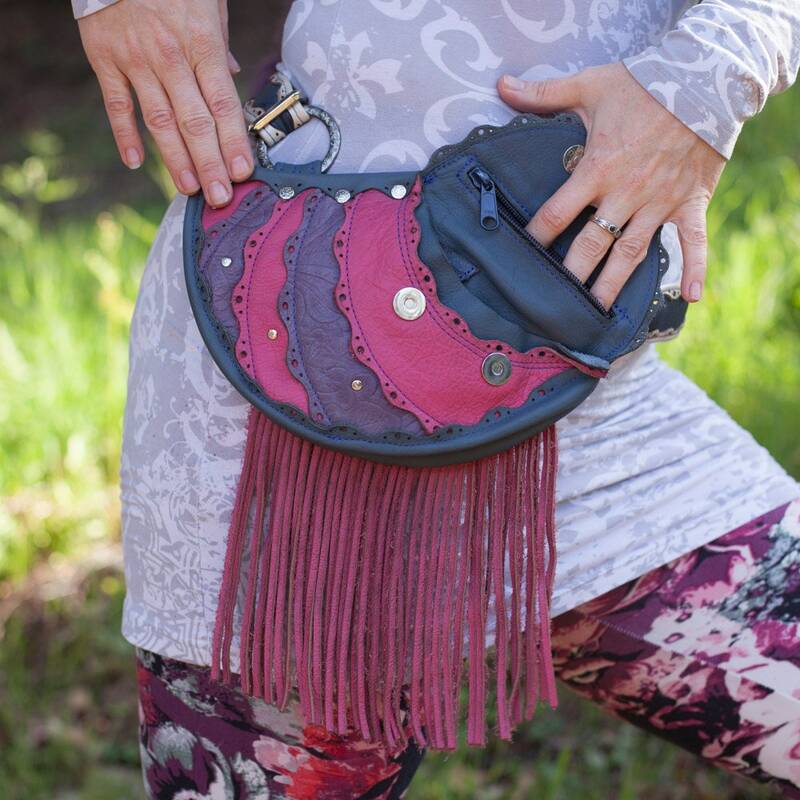 Over the years, we've had requests to make a single pocket version for those who don't desire the holster style and all its glorious modes of wear. 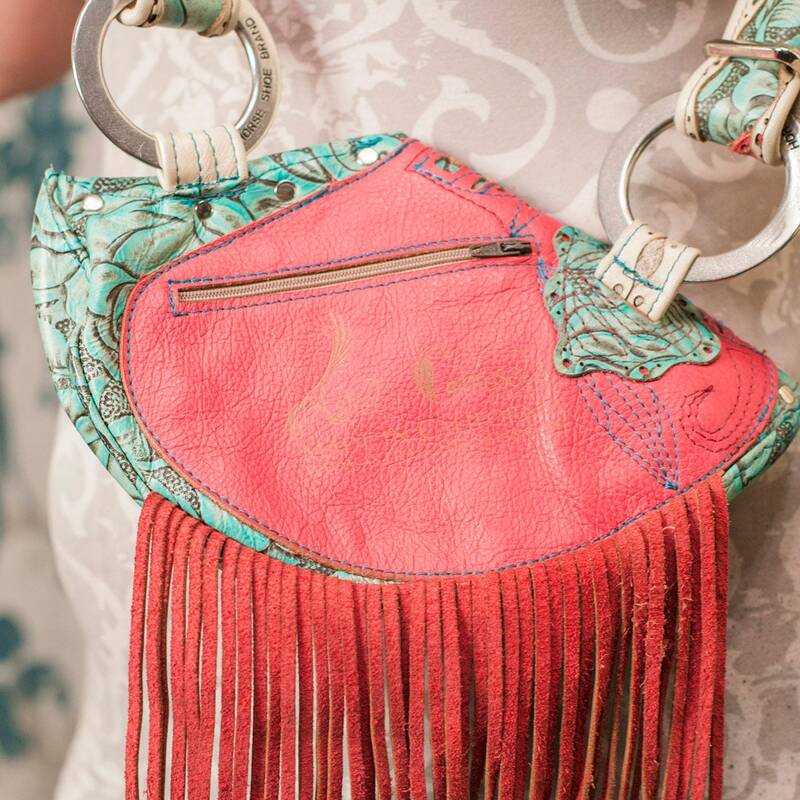 It finally happened when we had a sweet customer (thank you Blossom) custom order two single pocket Chrysalis Sling Purses and her request to add fringe to the pockets stuck. 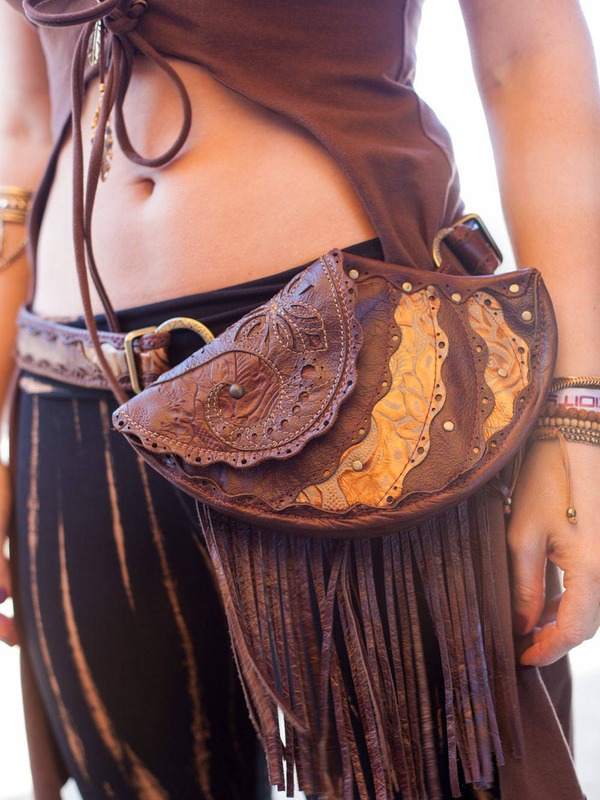 We've never been big on the whole leather fringe thing, but it really works perfectly with the curving shape of the Chrysalis pocket! 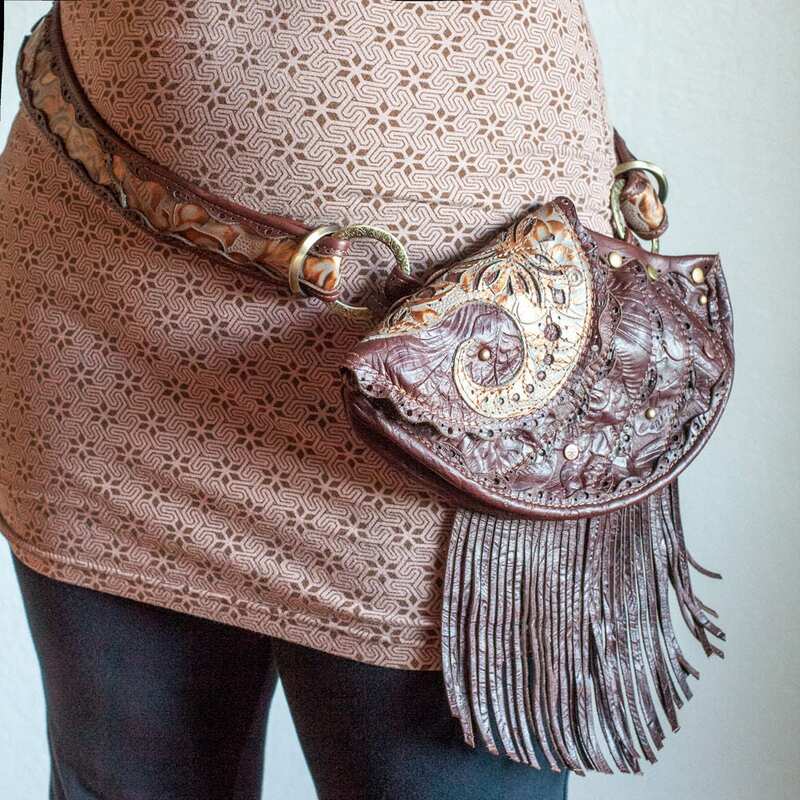 Although this design isn't as modular as the holster, it is still multi-purpose and can be worn as a shoulder purse, bandalero or as a single pocket hip belt! 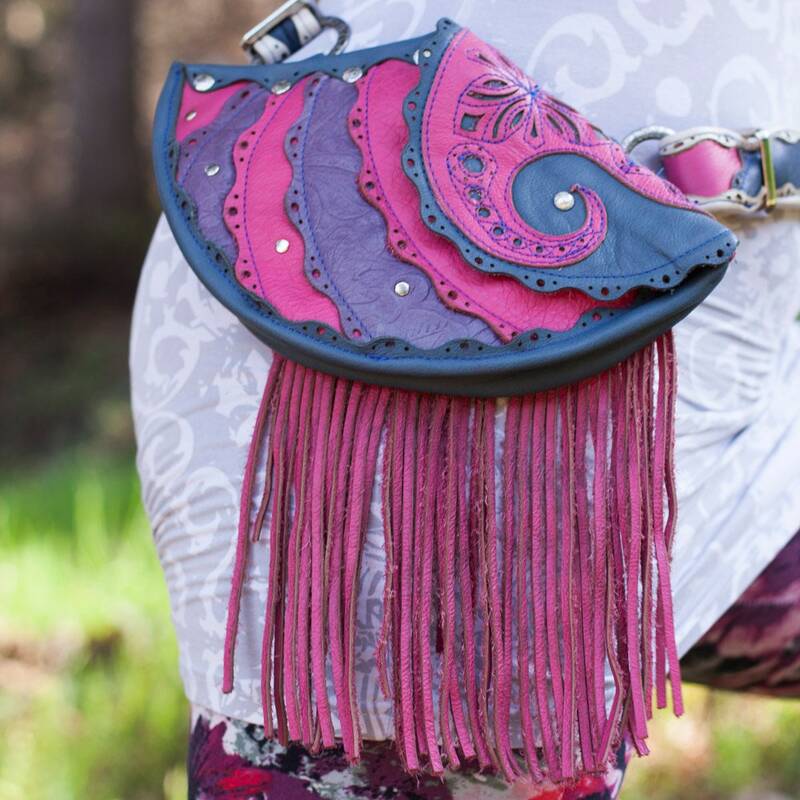 A beautiful unique piece of highly functional wearable art. 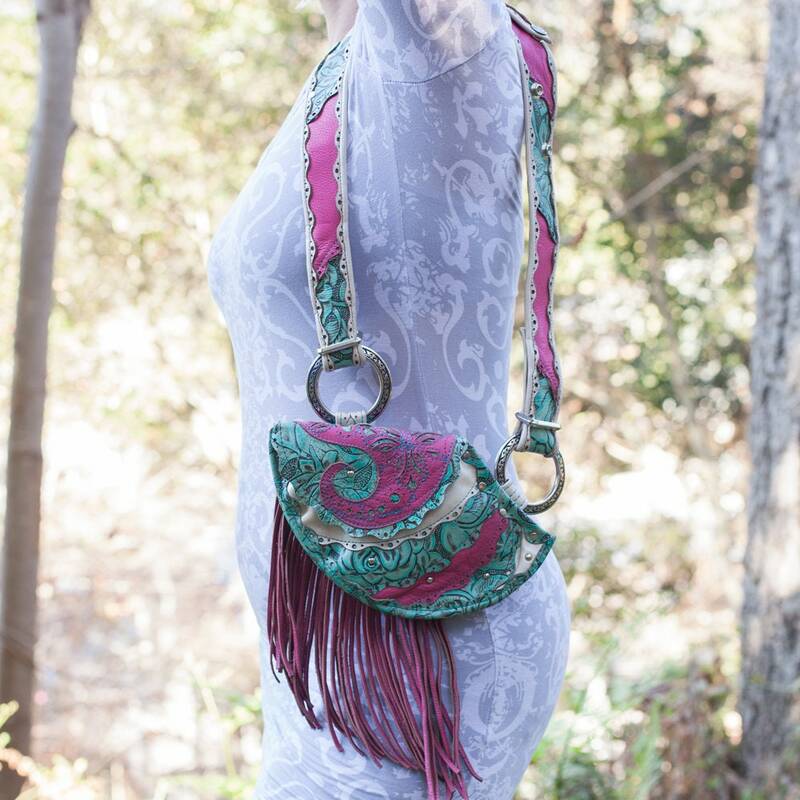 What makes the Chrysalis pocket so special? It's shape is inspired by the shape of a Chrysalis out of which a butterfly emerges. It's a pocket that has the curves of nature and the body rather than the usual angles you find in a pocket. Add in our signature scalloping, piecework style, intricate detail stitch and you really do have something special. 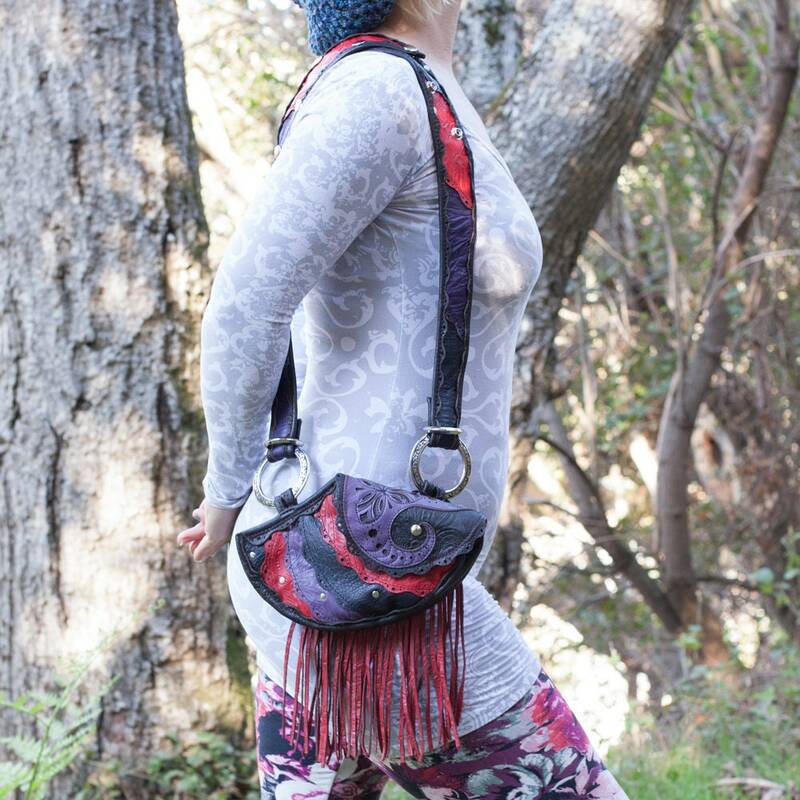 Best of all the Chrysalis pocket is deceptively roomy, with an interior zipper pocket that can fit my whole hand inside. Great for cash, change and that square reader you don't want to lose. The main part of the pocket has 2 credit card holders that will fit up to 4 cards each after they've been used/stretched a bit. This main section can also hold a phone as big as a Galaxy Note Edge, an array of lip balms and so much more. The front section of the pocket is great for receipts, business cards and non bulky items. The pocket securely shuts with two strong magnets. As if that wasn't plenty of room, there is also a zip pocket on the back of the purse that is great for change, cards, cash. 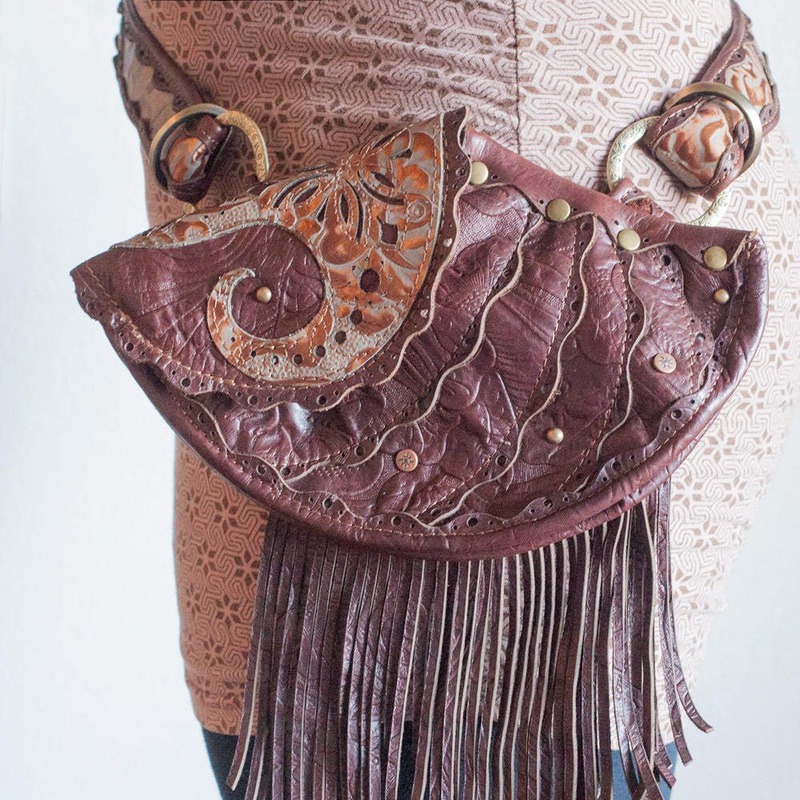 Do you love this design, but wish the hip belt could be a double pocket instead of a single pocket? Well it can be! Easy peasy, all you have to do is let us know you would like an additional matching pocket and we will create a custom/reserve listing for you. Cost for a single Chrysalis pocket with no straps is $200. 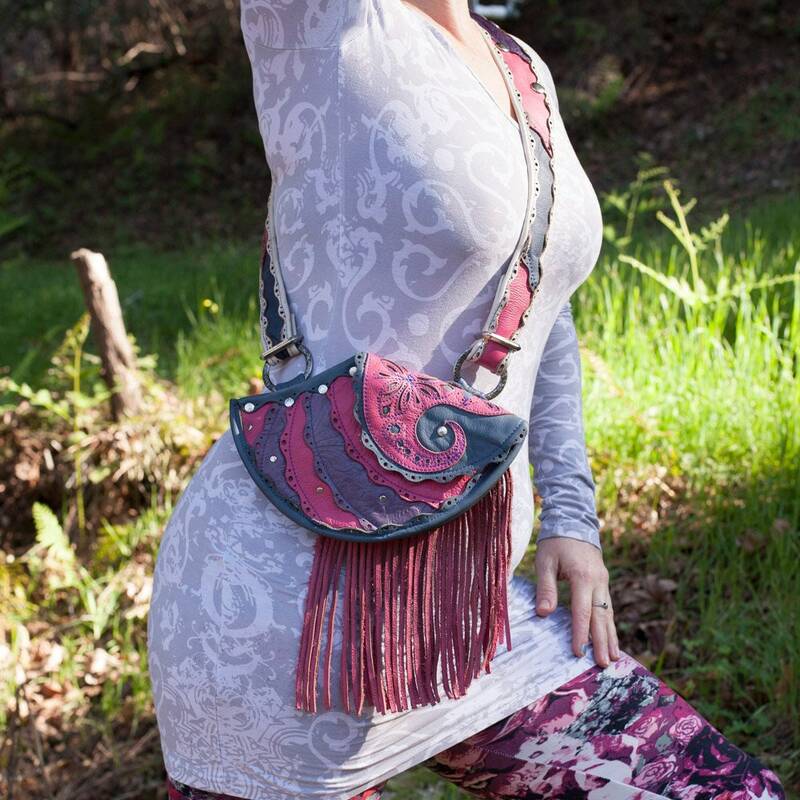 Alternately you can purchase 2 Single Pocket Chrysalis Sling Purses in complimentary colors and you will have 2 pockets when you wear it in hip belt mode. Wondering how you attach that second pocket to the hip belt? Its quite simple, the rings on the pocket snap securely right into the belt. • Do you want a right side pocket or a left side pocket? • With or Without Fringe? FYI, omitting the fringe does not change the price. All our items are made with our loving hands, in our home art studio. We guarantee all our work.